Feline arthritis can be caused by injury, infection, an autoimmune disorder, or degenerative problems involving the joints. If a cat seems stiff or painful, has swollen joints, loses muscle mass, or has a hard time moving around, it might have arthritis. Keeping a cat in good shape through proper diet can help relieve the symptoms. Medications and supplements can help, as can massage, acupuncture, and even surgery. Most cat owners think arthritis is a disease for dogs. They don’t necessarily look out for its signs. In fact, by the time most cat owners notice something is wrong they have a hard time believing that the loss of muscle and function is the result of arthritis. That is why so many cat owners tend to get a late start on treating the disease. Arthritis is a joint problem that can reduce mobility and elicit pain. It can be caused by injury, infection, the body’s own immune system, or developmental problems involving the joints. However, the most common form of arthritis in cats is called osteoarthritis or degenerative joint disease. Normally, joints form smooth connections between bones, but in the case of osteoarthritis, that smooth, glistening surface on the end of a bone is transformed into a roughened, poorly gliding surface. Osteoarthritis involves the thinning of joint cartilage (a protective cushioning between bones), the buildup of fluid within the joint, and, ultimately, the formation of bony growths within the joint. Over time, the roughness created by these bony growths can lead to reduced joint mobility and pain — even in cats. Recognizing arthritis in cats can be difficult because the condition progresses slowly and cats don't complain about their aching joints. Also, some owners assume that signs of arthritis (slowing down and stiffness, primarily) are “normal” in older animals. Taking a cat in for regular checkups can help a veterinarian identify clinical signs early. Radiography (X-rays) can reveal bony growths and joint abnormalities. Any cat can develop arthritis. Getting or keeping cats slim can help by decreasing the load on their joints. Carefully monitored exercise on soft surfaces can help affected cats. Because arthritis is aggravated by the cold and damp, affected cats should be kept warm and dry. Padded cat beds can help. Pain medication, including non-steroidal anti-inflammatory drugs (commonly called NSAIDs), may help relieve signs. Corticosteroids can be used to suppress inflammation, but they are usually used for short periods only. Acupuncture isn’t just for people. It’s painless and may help cats, too. 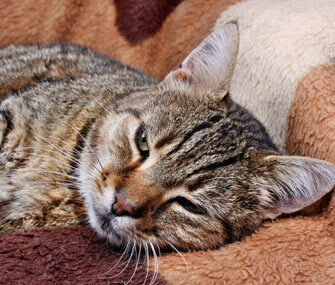 Surgery may be a good choice in advanced cases of feline arthritis. A low-stress environment, plenty of affection, and supportive care can help improve any cat’s quality of life. With many pet cats living well into their teens and even early 20s, most cases of osteoarthritis in cats are probably not preventable. But regular, moderate exercise and a high-quality diet can help manage body weight and help keep a cat’s musculoskeletal system in excellent shape. As pets age, osteoarthritis can appear gradually with very subtle signs. Regular veterinary visits provide a great opportunity to assess your cat’s joint health, get a diagnosis early during the course of disease, and start instituting changes to make your cat comfortable and improve his quality of life.